Nowadays, the next generation high definition video camera is getting popular and more popular, and the “HD style” consumers also looking for a simple way to transfer their HD footage to DVD or other storage medias. The well-known Japanese multinational corporation that specializes in imaging and digital products, Canon has taken care of this specifc consumer needs with its upcoming DW-100 portable DVD recorder which compatible with MPEG-2 as well as high definition AVCHD video codecs. As what you see in the photo, the latest DW-100 can connect directly to your camcorder without the need of PCs, aiming for easy transfer of camcorder footage direct to DVD. In addition, these DVDs will be of course compatible with any HD-DVD/Blu-Ray disk players including PS3. Furthermore, the users also allowed to plug the new stand-alone burner to any PC or MAC thanks to its built-in USB 2.0 connector. 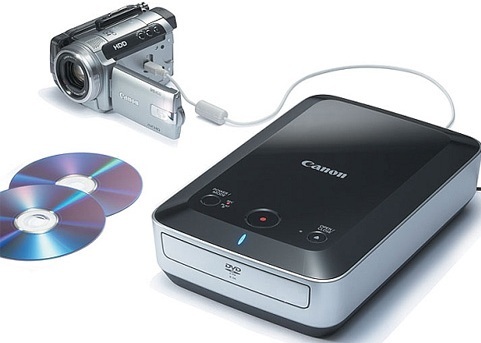 The latest Canon DW-100 portable DVD recorder which measures 179 × 70 × 275 mm and weights only 1.9kg is expected to be available in Japan in coming March 2008 for around 40,000 Yen.